The projector is equipped with the latest BrilliantColor technology for the Indian market. 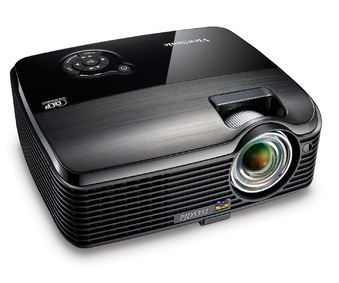 Monday, May 04, 2009: ViewSonic Corporation has launched its new DLP projector –- PJD5111 with enhanced network and multimedia capabilities offering contrast in images and video. Integrating BrilliantColor Technology with native 800 x 600 SVGA resolution that supports High definition signals and projects 2500 lumens for clear bright images in most lighting conditions, the projector achieves outstanding value with highest performance standard available, the company claims. The PJD5111 projector comes with six-segment colour wheel which enriches the yellow colour performance that is key to accurate and vivid colour reproduction. At 2.3 kgs, ViewSonic's PJD5111 projector is light and compact. The Direct Off feature allows the busy presenter to simply unplug the projector and go without waiting for the usual cool down phase. This feature also protects the lamp from sudden power blackouts. Incorporation of Eco Mode further extends the life of projector lamp by upto 4000 hours and helps reduce noise output. PJD5111 from ViewSonic is a full-functional multimedia projector with two RGB inputs and one RGB output making it a multifunctional data/video projector. PJD5111 will be available in India from May 2009 onwards through ViewSonic India's authorised distributor Redington India Limited at an MRP of Rs 37,000 inclusive of all taxes.